This book proposes third generation coaching in a form where the coach and the coaches are less concerned with solutions and more concerned with creating space for (self-)reflection through collaborative practices. Offering a revisited and innovative approach to coaching psychology, advantageous for learners and practitioners alike. It marks a new trend in coaching and has a special profile, based on the acknowledgement of changes in society, learning and knowledge production, as well as leadership. 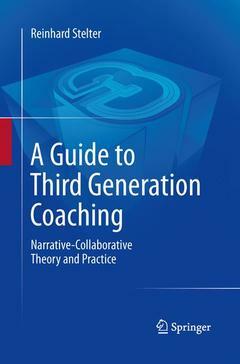 The author’ s concept of ​​coaching distinguishes itself from the existing models (pop coaching , GROW model, etc) by offering a fresh analysis of our society – a society that is characterised by diversification, identity challenges, abolition of the monopoly of knowledge, lifelong learning, the necessity for self-reflection, etc. These societal changes are the basis for the existence of coaching and its prevalence, but they must also be the foundation for the way we employ coaching. Reinhard Stelter holds a PhD in psychology and is Professor of Sport and Coaching Psychology and head of the Coaching Psychology Unit at the Department of Nutrition, Exercise and Sports, University of Copenhagen. Furthermore he is visiting professor at Copenhagen Business School (Master of Public Governance). He is Honorary Vice President and accredited member of the International Society for Coaching Psychology, member of the Scientific Advisory Council of the Institute of Coaching at Harvard and editorial board member of the International Coaching Psychology Review, of Coaching: Theory, Research and Practice, of the International Journal of Mentoring and Coaching and co-editor of Coachingpsykologi - The Danish Journal of Coaching Psychology as well as editor and author of many books and journal articles. His theoretical ground in coaching is inspired by phenomenology, systemic thinking, social constructionism and narrative and collaborative practice. In 2009-11 he has been leader of a research project – a randomized control trial – with a focus on narrative-collaborative group coaching, where he could document and positive effect of coaching on personal well-being and social recovery. During the last couple of years he has been invited speaker on coaching and coaching psychology conferences in many parts of the world.